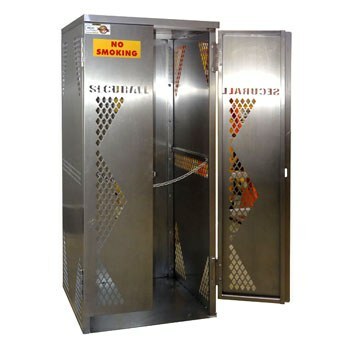 SECURALL Aluminum 5 to 10 Oxygen Cylinder Storage Cabinets are perfect for safely storing Oxygen and Gas Cylinders. With 12-gauge aluminum construction, these cabinets resist weathering, corrotion and sparks. Cabinets ship fully assembled and are 1/3 the weight of steel models, saving on freight charges.